MAGICAL BEANS AND OTHER (THINGS THAT GROW IN THE) DIRT! 1) The Magic of Beans…According to a study published in the Archives of Internal Medicine, eating 1 cup of beans each day for 3 months can reduce blood pressure, heart rate and overall cardiovascular disease risk. The high amounts of potassium and magnesium in beans/legumes may play a role in regulating blood pressure naturally. That’s great health news and beans are an awesome way of helping to stay full and get more protein, so make like Jack and start loving your beans! 2) Mushrooms may have more magical properties than we already know! We may actually be fighting cancer with every serving that we consume. When scientists at the University of Pennsylvania fed dogs with cancer a compound derived from certain kids of mushrooms, they found the dogs given the highest amount of the compound lived longer than those that got less or none. Mushrooms contain the compound polysaccharopeptide, (wow, that’s a long one) which may suppress tumor growth. While more research on humans is needed, we already know that mushrooms have all sorts of nutritional and health benefits, and they come in such a vast variety, I say we make like Alice and include magic mushrooms in our own Wonderlands. 3) This last one is so simple it blew me away. 20,000 cases of cancer could be prevented annually if half of all Americans ate just one extra serving of produce daily. This stat would lead me to believe if we ALL ate just one more serving of produce daily, we could double that number. So, on this Vegan (Feast) Thursday, I remind you that substituting just one meat meal for some veggies and beans might make a big difference in your own health and will certainly make a big difference in the world. It’s that simple…or magical. If you are planning on attending our annual SilverSneakers luncheon, today is last call for money. I can’t believe there are still people who haven’t paid because our current headcount of people who have paid for the event is…………………….158 people! YIKES!!!!! If you haven’t paid and still want to attend, come to class today at 11:30 with $10.00 in an envelope with your name printed on it. If you need specific details, email me here and I will get back to you, personally. Like every year, it’s nice to have an opportunity to all be together socializing in a different environment. And with as much as we exercise together, we gotta eat! First, I have to say how thankful I am for the invention of the DVR. While I am not a huge TV watcher, it seems whenever I like a few shows, they all compete for the same time slot. When Biggest Loser returned this year, I quickly opted for it, over the CBS shows that make me laugh on Monday night. But now, the return of one of the few shows I really got into last season, also came back on Monday night. Yes, Mitch and I immediately got hooked into the new Dallas, which brought us right back to our younger years watching the drama at South Fork. Thanks to my DVR, I was able to watch the folks at the BL ranch last night and can still look forward to the Texas ranch later in the week. If you were a fan of Dallas back in the day, check it out! Last night’s episode of BL found the trainers skyping with the 3 junior ambassadors. I am finding those connections tough to embrace. Dolvett just doesn’t seem a real trainer match for Lindsay with her cheer-leading goals and seriously, Bob, simply telling Bingo to get out there and play baseball with his friends, when he has a boot on his foot that is holding him back, is just unrealistic. Didn’t he just hear the poor kid say he can’t keep up with his friends? Has Bob forgotten what it’s like to be a kid–and a kid with the nickname Bingo, no less? Meanwhile, back at the ranch, the lesson of the week is grocery shopping on a budget of $10.00 per person, per day. I think this was very valuable for the contestants and the viewers. People tend to b*tch that shopping for healthy food is too expensive. It can be. But learning to shop for locally grown and seasonal items changes the game. Sure a bag of potato chips is cheaper than a container of nuts, but since portion control only suggests limiting nuts to a few of these and a few of those, that container should last all week and then some. The bag of chips will probably be gone in a day or two. So grocery shopping is a mind game, just like the rest of this game. Danni, who is alone on the white team, seems to have some big advantages, even as she struggles through the obvious disadvantages. Being a strong, focused, individual she has no one to compromise with, or bring her down. This worked exceptionally well for her in the challenge. Each person had to swim bringing 10, 5 pound “coins” to their team colored fountain. Danni, who used to swim, knocked this one out of the park and got to choose between a phone call home or a 2 pound advantage. She took the 2 pounds, but in the end, could have taken the phone call and still escaped elimination with a 9 pound loss on the scale. While Bob’s team doesn’t get much attention, and no one on his team has captured my attention, Alex did finally have a great week, finally hitting double digits with a 10 pound loss. I can’t wait to see her in a few months! Actually, Bob’s team quietly all did very well. And while Dolvett’s team HAS captured my attention, and they seem to train really hard, they fell short on the scale and had to send someone home. They sent home Lisa, and I agree she seems like she can do really well at home, as her attitude is good and she probably misses her husband and kids terribly! So far, so good. When we did see her at home, she was out playing with her kids and down 76 pounds from 246 to 170. Happy 26th birthday to beautiful, bright and sweet Nicole. We love you! FOR STRONGER MUSCLES, LET THE SUN SHINE! Attention: Muscles aren’t made exclusively at the gym and getting some sunshine on your body may do much more than just give you a little glow. Sunlight is strong and it may be the secret to big muscle! (And also to better balance!) Studies show that people with higher blood levels of vitamin D tend to have stronger upper and lower body muscles. For us in South Florida, we can benefit from the rays of the sun just about 365 days a year. It only takes about 10 minutes of exposure daily to keep levels of this powerhouse vitamin working for you. While vitamin D2 is found in most every kind of mushroom, D3 is found in only animal products. None of these sources, however, come close to the power of the sun. If you live in a part of the country that makes it hard to get your D during the winter you may want to consider a supplement, which I would say is a safer route than trying to eat all the animal products that come with their fair share of health risks. Popping 600 IU of vitamin D daily, should work to keep your levels up–until the sun heads back your way. Remember to expose your arms and legs to that sunshine to get the full benefits. And no…no sunscreen. Just remember it only takes minutes to reap the benefits. More than that and of course it’s time to screen up and protect against TOO much sun. Ahhhh the never ending balancing act. What do you think of when someone says the word yoga? Most people immediately get the sense that yoga is all about twisting into a pretzel, but yoga is so much more than movement, in fact much of yoga is in in the heart and mind. Consider the word santosha, which translates to contentment, or appreciation of what you already have and know that yogis believe that cultivating santosha leads to “supreme joy,” or the ABSOLUTE. The best part about santosha is that we can all cultivate that attitude of gratitude by simply making it a part of our daily existence. I am putting out a challenge to myself as well as all of you, today. Just for this day, let us work at finding ONLY the good in things. Sure, we all know that it’s unrealistic for any 24 hour to be filled with ONLY good, but just for this day, let us all try to overlook what isn’t and simply focus on what is. So for me, so far my thoughts are like this: I slept pretty well…I woke up before the alarm clock rang…I am on schedule for my first appointment…my computer is working well…my coffee tastes excellent…I have a closet full of clean clothes to choose from…and food in my fridge and pantry…and though I could go on, I am certain you get the picture. Let’s do this together and see how much good we can all find in this day…it is, after all, Saturday and if we can’t practice santosha on this day, when can we???? Much love everyone. Hoping you find more good in YOUR life today than you ever imagined possible. It’s almost the weekend, and a little game of Bball might be just what you need to get your fitness and fun on at the same time. No worries if you don’t have enough people to play full court. Turns out playing 2-on-2 hoops challenges your body more than playing bigger games. According to a recent study in the Journal of Sports Sciences, athletes who paired off for 2-on-2 games spent more time at over 90% of their heart rate max. Makes sense since less hands on the court translates to more sprints and jumps than in a bigger game of 4-0n-4. The extra benefit is that you’ll probably hone your skills a little better as well, since you’ll be forced to repeat more technical moves like dribbling, passing and of course, shooting! It is my personal opinion that all those moves make for some of the nicest shoulders and arms in the world!! Work on gathering 3 buddies, and get yourself a little game going this weekend. What a great way to balance a hard (and sedentary) week at the office. There is no question that building and maintaining strong muscles and bones is a really important to optimal wellness. Personally, I never give much thought to my bone health, as I am a strong believer that strength training is the single most important thing we can do to either maintain or increase bone density. Just as people are concerned about getting enough protein on a plant-based diet, we also need to make sure we are living in a way that supports strong muscles and of course our skeleton! Without good bones we are like clothes without a hanger, just waiting to fall and crumble. While we have been raised (by the dairy industry) to believe that dairy is the key to strong bones (and have been wooed by beautiful people sporting milk mustaches) I choose “not milk” over “got milk” and am certain that we can all get more than enough calcium (and probably absorb it much more efficiently) by simply remembering to include some of the foods below. 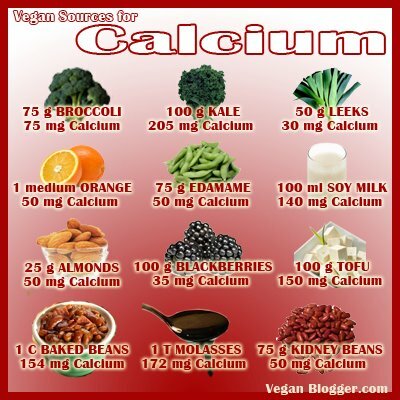 Most non-dairy milks contain a large amount of calcium and often cereals are calcium fortified as well. But who knew even a little orange can help build strong bones? Thanks to Pete for posting something similar to this on FB recently. I am thinking of taking a photo of him with a soy or almond milk mustache and starting our own campaign! Maybe even a calendar?!?! Think how many people would love to flip the page and find Pamela Anderson sporting her “NOT MILK” mustache…. And again, thanks to Derek and Jolene for sending me the book The Veganist. Kathy Freston has such a lovely, non intimidating, easy to understand way of writing about leaning into a plant-based diet. While I loved her book Quantum Wellness, this one might be the ONE book I recommend to ANYONE vegan-curious. She divides up her “promises” into chapters that can be read out of sequence. The promises all ring true to me and I find myself shaking my head in agreement to things she explains, that I could never explain as well. Admittedly, I have not been able to read the chapter on animal suffering. I have read enough about this and though my first reason to lean heavily into this type of eating was based on my own health and weight, I am enormously happy that my choice makes such huge impact on animals as well as helping to protect our environment and help feed the hungry. It also sits really well with the yogi in me who truly believes in DO NO HARM. If I have said it once, I have said it a bazillion times. What is good for us, is good for the world around us. We can resolve health care costs, wipe out hunger and help stop global warming with just one tool—a fork. At each and every meal we have more power than we can imagine. Just ONE meatless meal today WILL make a huge positive impact. I hope you will consider this as you sit down to your next meal. Thanks so much for checking in this morning. While I love blogging every morning, it is on Thursday’s that I hope to make people think the most because we all know that we really are what we eat! If anyone local wants to borrow my copy of The Veganist (or The China Study…or Quantum Wellness…or anything else I have in my library), just say the word. Cleaning out my closet recently, I tried on some old jeans that were from my premenopausal days. While they fit most everywhere, they clearly would not zip up! How frustrating! Though weight gain and menopause do NOT have to go hand in hand, for me there was another factor. Back in my 30s and young 40s I never thought twice about taking a little ephedra (Diet Fuel) to help boost my energy through my long days of working out, and yes, to help keep my weight just where I liked it. Along with peri-menopause, I started to notice I was grinding my teeth at night, and my heart rate was higher than I was comfortable with AND the bad press about ephedra started coming out. I stopped taking them and over the course of the next few years, I put on a stubborn 10 or so pounds. I do NOT attribute this as much to menopause as I do stopping those little metabolism boosters…though I am certain it’s a combination of both. In any event there are things we can do to help fight the menopause weight gain. Once again, the same “diet” that is good for everything else, is helpful at this stage as well…lots of fresh veggies, fruits and lean protein. In fact, Dr. Oz and Dr. Roizen suggest going vegan/vegetarian which will eliminate virtually all saturated fat and cholesterol (well, let me clarify–a vegan diet will do that, a vegetarian diet, not as much). And though I believe everyone in the entire world should strength train, doing it after 50 will help combat the automatic loss of muscle mass that occurs at this age. Finally, getting that all important cardio work in is paramount. Walking, bicycling, and any type of aerobic class will satisfy this component. So though menopause is a fact of life, don’t be blaming it entirely for your weight gain. As we age we have to accept that some change is undeniable but that doesn’t mean we can’t work a little harder to not let that change defeat us! This morning I woke up in conflict. I keep thinking about those stats on kids spending an average of 4.5 hours a day looking at a screen. I consider myself rather active, but still it’s hard, some days, to NOT spend too much time screen watching and part of my conflict is that Biggest Loser accounts for 2 of those hours–which seems like a conflict within itself. Perhaps my friend Bonnie has it right as she does things like hula hoop, or work her arm hoops while watching TV instead of just sitting. Anyway, I did spend my dedicated 2 hours watching the show last night and this morning I wonder if it was worth the time. The trainers left the ranch this past week to go visit with the 3 junior ambassadors. I realize this was very important as this season is devoted to fighting childhood obesity. I am not sure the activities they did with the kids really resonated with most of our youth. How many kids have the opportunity to get in a row boat with a team and learn to row, like Sunny. It was great to see Bingo play baseball at the home team’s stadium, but again, not something most kids can make happen. And seriously, the cheering segment with Lindsay (and I am NOT down on cheerleaders, having been one (and loved it) myself, but when Dolvett said it was a good workout and then they did all did a little cheer that was NOT at all a workout, I was left shaking my head. And back at the ranch, the contestants were left on their own to figure out how they would be the scale at the end of the week. At least Alison took them out for their challenge, a 5K, which was the highlight of the show. The winning team would split $15,000 dollars and in this case, it was a gift that the white team was down to 2. They won and walked away with a nice prize! The trainers came back for a last chance workout and the weigh in. Dolvett’s red team did well and I was elated to see that Jackson’s turnaround this week, taking on the role of leader, led to a 12 pound weight loss. I have a soft spot for him and was thrilled to see him start coming into his own. Bob’s blue team needs a lot of help. They need a fire lit under their butts or something. I think Bob is an awesome trainer, but his team is just blah. With just 2 left on the white team, they needed a combined weight loss of over 12 pounds or the one with the lesser weight loss would automatically go home. Danni, who I see in the finals, put a 12 pound loss on the scale, but Pam, who did the dance of joy last week, saw a loss of only 3 pounds and honestly looked quite relieved to be going home. She left with class and a smile on her face and seems to be doing well at home. Now, with just Danni left on Jillian’s team, I suspect some shaking around of the teams next week. And though I always look forward to watching BL, clearly the highlight of yesterday’s screen time, was watching the Presidential inauguration and the hoopla that surrounded it. I felt so proud to be an American watching him being sworn in on Martin Luther King Day. Seeing the likes of James Taylor and the drop-dead gorgeous Beyonce perform our nation’s anthems brought me to tears (more than once). Thanks, Mitch for remembering to record it for me while I got the balance to my screen watching in, at the gym and on the streets! I also managed to get in my hooping (which I try to do about 4 times a week). I am up to about 8 minutes of waist and hip hooping and several minutes of arm hooping in different positions. I am finding it a very yin way to get in some different muscle work and I like it! And now, after discarding spam and composing this blog I have used up a good chunk of my screen time, so I am off to get moving. I know one big-red-guy who is always very happy when I step away from the computer in the morning. He knows it’s getting on time to take that morning walk and we both are always just a little happier during and after our daily ritual. I hope that you will take some time to get your “physical” in, too.